Just a day after his Hall of Fame induction ceremony, Terrell Owens tried out for the Canadian Football League’s Saskatchewan Roughriders. According to Owens, “It’s key when you’re trying out to put your best foot forward, and I’m very pleased with what they saw and what I did out there. To be inducted into the Hall of Fame and come back and play, why not me? I know I can do it; it’s just a matter of someone giving me the opportunity.” Owens is 44 years old. 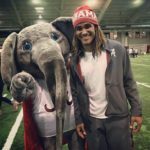 In college football news, Alabama quarterback Jalen Hurts recently expressed his disappointment on hearing comments about his quarterback situation. Hurts commented on the “narrative” floating around that he’ll transfer if he’s not given the starting QB role. According to Hurts he never said anything about transferring. “Nobody came up to me this whole spring…nobody asked me what my future held.” Coach Nick Saban is notorious for keeping a tight lid on how the team interacts with the media, so it will be interesting to see how he responds to Hurts speaking out. In a ridiculous story coming out of the Pac-12 media day, reporter Dennis Dodd lambasted Stanford running back (and Heisman candidate) Bryce Love for skipping media day to attend class. Love apologized for skipping the media fest by saying, “I really wanted to be there to represent the university. But I decided I just wasn’t able to make it happen this year. Based on other commitments, trying to graduate in December required me to take more classes over the summer.” These players are still considered “Student-Athletes”, so it’s unfortunate a reporter would reprimand a player for keeping up with his academic commitments. Red Sox sweep their 4 game series with the Yankees. Yankees trail the Red Sox by 9 1/2 games in the AL East. The Oakland A’s are also on a streak winning their 6th straight game.